The first hat I did was with a ball of brown that I now have a couple of meters left of (and no longer seems to exist), so I went with a beige for the other two hats. I cast on 100 stitches on 4 1/2mm needles using Patons Classic Wool worsted. I started with the wine colour and did 12 rows of Twisted Check, pg 20, then joined back into the cast on edge. I switched to brown and green and used Honeycomb Tweed, pg. 57 for two inches, then switched back to wine and the first stitch for 4 rows. 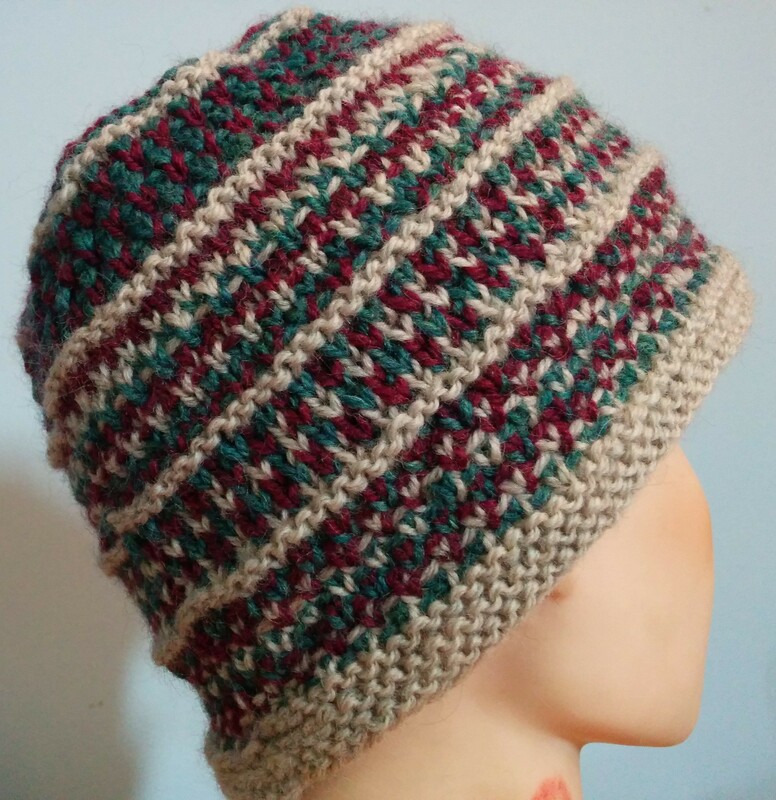 The main body of the hat is done in brown using Block Stitch or Dice Pattern, pg 19-20 using the seed block stitch, the garter block stitch, the knit/purl block stitch for one repeat each then using Garter and Rib Check, pg 21 before I switched back to garter block stitch for the decreasing. 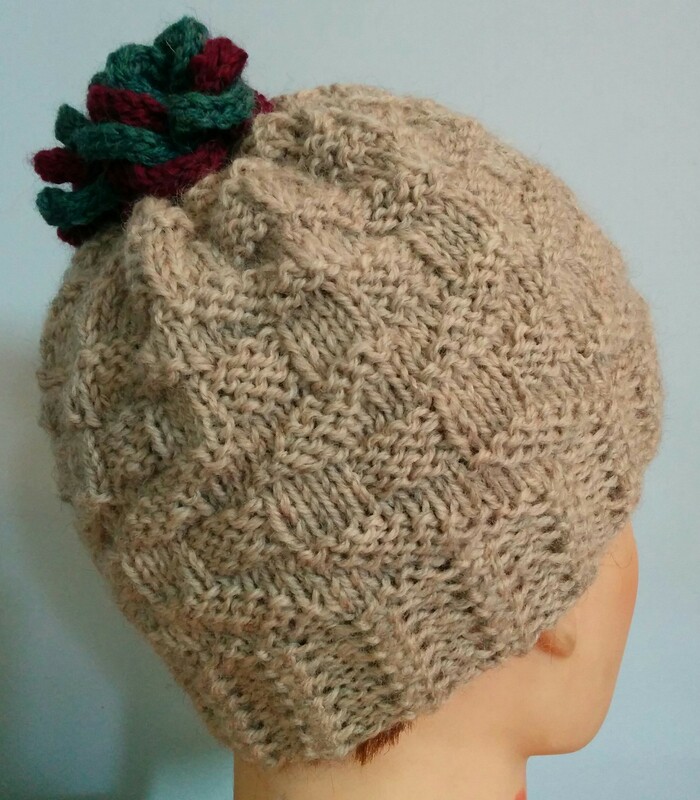 This next hat uses Zig Zag Knotted Rib, pg 43 and Van Dyke Check Pattern, pg 222. I cast on 97 stitches with straight needles to do the ribbing (4 1/2 mm needles and Patons Classic wool, worsted). I used the straight needles because I wasn’t sure I could recreate the stitch correctly on a round needle. 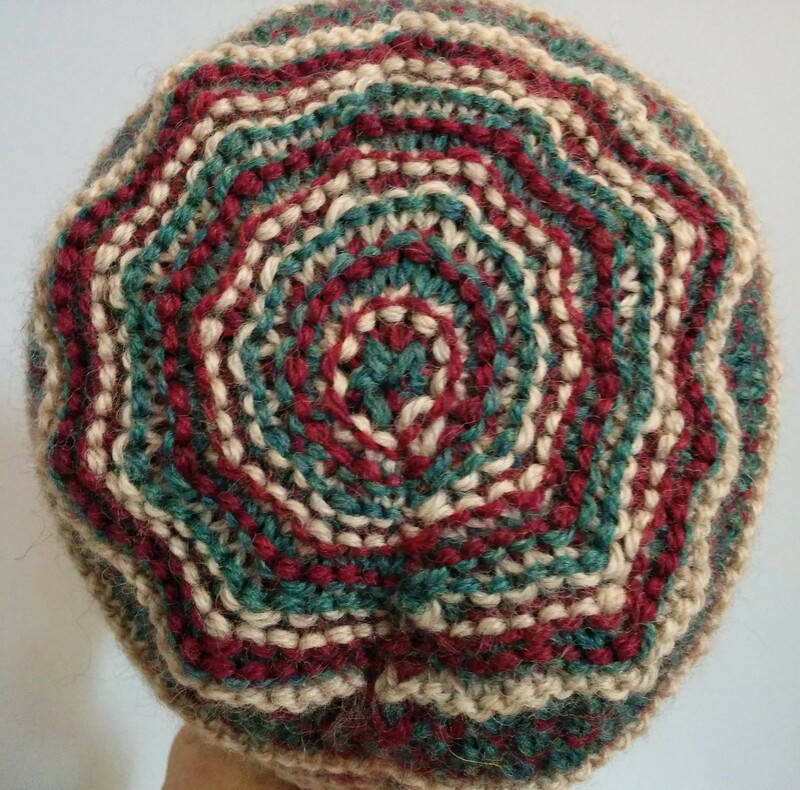 I switched onto a round needle and decreased one stitch at the beginning/end of the round before starting the main part of the hat. I. tried to decrease in pattern but the top was not great, so I put the i-cord rose on the top in the wine and green colours. 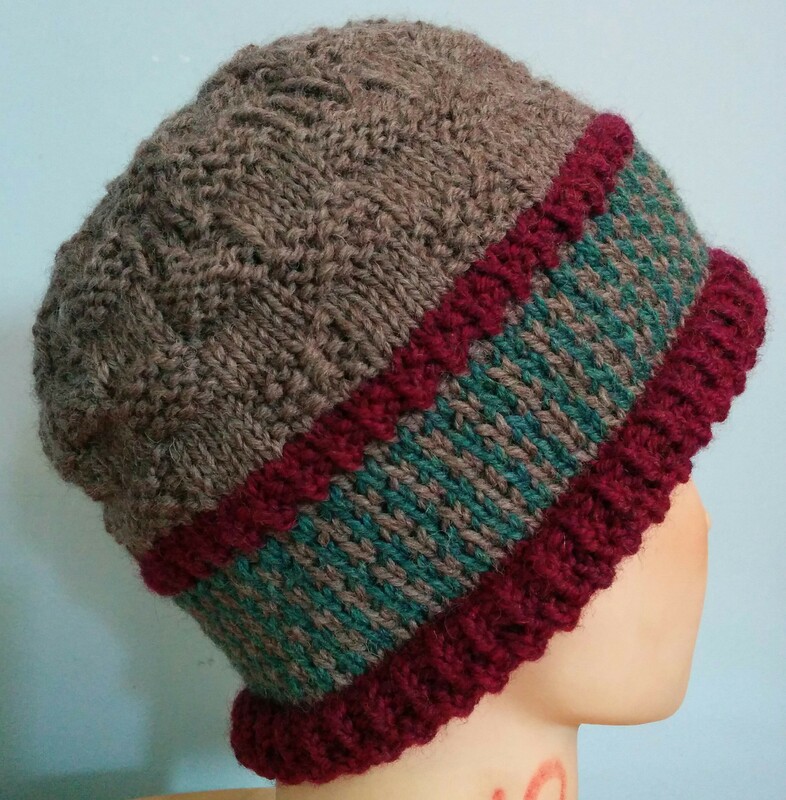 This is the last hat I am doing in this colourway, at least for now. It is a bit of a sampler again. I cast on 100 stitches with same needle and wool as before and did 6 rows of garter stitch before changing to Tricolor Stripe Pattern – woven version first for one repeat, then two rows of garter stitch and one repeat of the stranded version. After another two rows of garter stitch I did one repeat of Three Color Tweed, pg 61, then two rows of garter stitch and 12 rows of Semi Woven Tweed, pg 60. I did the top in just garter stitch, changing the colour after each row. I used 10 points of decrease and decreased with a purl two together at each on the purl rows (p8, p2tog, etc…). After the row that gave me 10 stitches left, I did the knit row, then did p2tog around and finished off. I actually quite like the effect, if I do say so myself. 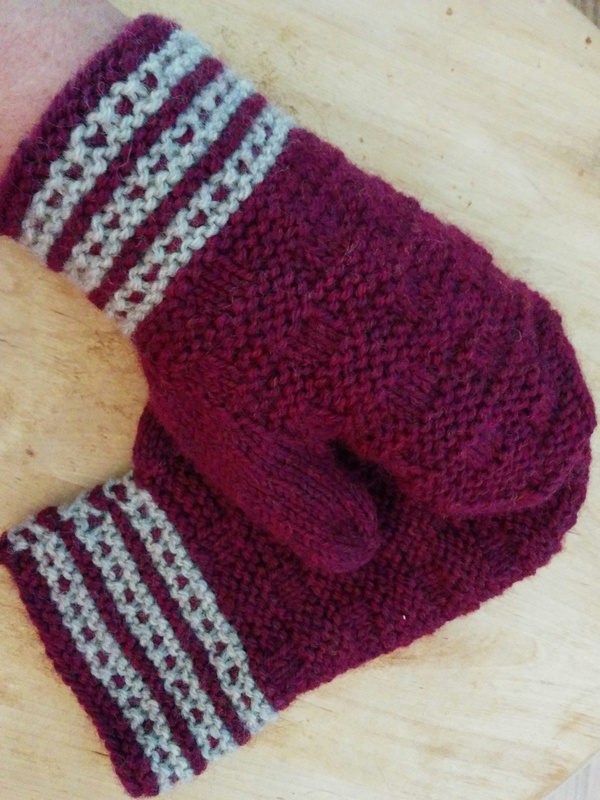 This entry was posted in Barbara Walker and tagged Barbara Walker, Patons Classic Wool on July 9, 2015 by gillianknitter.